The Manoleas Taverna is just a few minutes' walk from the beach and is set in mature gardens with its own play area for young children. 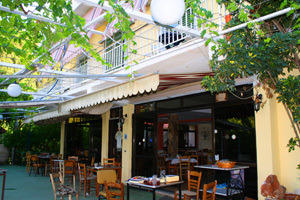 It is a great place to eat at any time of the year: in the winter, there is a traditionally decorated indoor dining room with a log fire and old black and white photographs of the area on the walls, while in the summer, you can sit in the green, shady outside terraces for relaxing lunches and romantic moonlit dinners. The Manoleas is also a wonderful choice for unforgettable holidays. 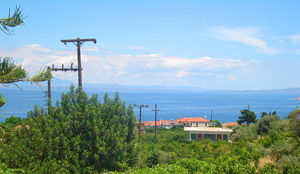 The double or triple rooms have spectacular views of the sea. It is conveniently located just 300 metres from the beach and is a relaxing and friendly environment which makes it an excellent base from which to explore this very traditional part of Greece.